No Federal agency has judged the merits or value, if any, of this property. No statement should be relied upon except as expressly set forth in the Nevada Public Offering Statement. This is neither an offer to sell, nor a solicitation of offers to buy, any condominium units in those states where such offers or solicitations cannot be made. WARNING: THE CALIFORNIA DEPARTMENT OF REAL ESTATE HAS NOT INSPECTED, EXAMINED, OR QUALIFIED THIS OFFERING. Pricing and locations of units are subject to change without notice. Views and locations of units within the project are not guaranteed and the buyer is responsible for inspecting the unit and its location before signing any agreement with respect thereto. Any square footage numbers are approximate. © DK Juhl Residential, LLC. Unauthorized use of the images, artist renderings, plans or other depictions of the project or units is strictly prohibited. A DK Las Vegas LLC Community. A DK LAS VEGAS LLC COMMUNITY. As if Vegas doesn’t sizzle enough, Juhl brings the heat to the city’s thriving Downtown neighborhood with its summer kitchen and grilling stations. The Canvas Grill is situated next to the resort-style pool, spa and fire pit, where residents can enjoy a poolside BBQ, then take the party upstairs to the 10th Floor Vino deck or to the al fresco movie theatre. 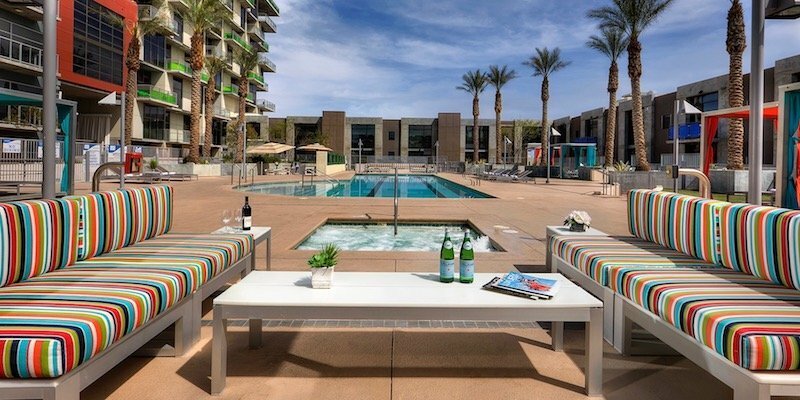 The outstanding outdoor amenities are among many enjoyed by residents of Juhl’s flats, two-story lofts, brownstones and penthouses, situated amidst the energy excitement of Downtown’s thriving Arts and Business Districts.